Take a medium-sized skillet out (we used a saucepan) and add the peach preserves to it, setting the skillet over medium heat. Once the preserves have melted, mix in the chili sauce, molasses and bourbon. Once the mixture’s at a boil, stir in the chicken and turn the heat down so it’s at a simmer. Let simmer for 5 minutes. During those 5 minutes, take the bottom half of the buns and place the lettuce, tomatoes and red onion on (if you’ve decided to use red onion). Use tongs to take the chicken out of the sauce and divide it among the bottom buns. Top the chicken with the top halves of the buns. Eat right away with some extra sauce on the side. This tasted really good ! Even if you don’t dip your sandwich into the extra sauce, this can be a bit messy so make sure you have some napkins or paper towels nearby when eating this. This was good even without the tomato, the onion slices provide a sharpness which contrasts against the sweetness in the sauce. We weren’t paid in any form to promote Smucker’s, Heinz, Jim Beam or Beyond Meat. Move the rack in your oven down to the lower-middle position before preheating the oven to 325 degrees. Place the pork, 1/2 cup of the gochujang, 2 tablespoons of the miso, cilantro stems, hoisin, ginger and 1 cup of water in a large Dutch oven, stirring to combine. Set the Dutch oven over medium-high heat, waiting for simmering to occur. Once simmering, put the lid on the Dutch oven and place it in the oven. Let the pork cook for 3 hours or until it pulls apart easily using two forks. While the meat cooks, take a 12-inch nonstick skillet out and pour the oil into it, setting the skillet over medium-high heat. Once the oil’s hot and shimmering, add in the onions and 1/2 teaspoon salt, turning the heat down to medium once they’re both in. Cook for 15 minutes or until the onions look golden, stirring now and then during that time (it took us longer than 15 minutes). Mix the miso into the onions, stirring constantly for 5 minutes or until the miso begins to brown. Take the miso onions out of the skillet and put them on a plate to cool down, covering them once they’re cool and putting them in the fridge until they’re ready for use later on. Once the pork is tender, remove it using a slotted spoon and put it in a large bowl (we used a large plate). Once the pork is cool enough for you to handle, shred it into bite-size pieces, throwing away any globs of fat. Going back to the Dutch oven, take the ginger chunks out of the liquid, throwing them away. Tilt the Dutch oven so all of the liquid pools to one side, skimming and throwing away as much of the fat on the surface as possible (we didn’t get rid of the fat). Put the Dutch oven over medium-high heat and let the liquid cook for 5 to 7 minutes or until a spatula (we used a spoon) run through the sauce leaves a trail behind (took us longer than 7 minutes). Whisk in the remaining 4 tablespoons (1/4 cup) of gochujang into the sauce until combined. Mix the pork and onions into the sauce, turning the heat down to medium afterwards. Stir the pork around constantly for 5 to 10 minutes or until all of the pork and onions are heated through. Take the Dutch oven off the heat and stir in the vinegar to combine. Taste the pulled pork and season to taste with pepper (we didn’t add any pepper). Place the meat on the buns, topping with the cilantro leaves, pickled carrrots, gochujang sour cream, and pickled jalapeños. Whisk the vinegar, sugar and salt together in a large bowl before adding the carrots and ginger, stirring to coat the carrots and ginger in the vinegar mixture. Cover the bowl and place it in the fridge for at least 3 hours or up to 24 hours (we made our pickled carrots the day before we made the pulled pork). Mix the 2 ingredients together in a small bowl until combined (make sure to scrape the sides and the bottom of the bowl). Put a lid on the bowl and place it in the fridge until ready for use. The components taste good separately but together are even better ! The pulled pork was tender, spicy and a little salty but the pickled carrots and jalapeños brought enough acidity to balance that spiciness out. You might think that this’d be too spicy between the jalapeños and the gochujang in both the pork and the the sour cream but the sour cream itself, the pickling and probably the bread as well allows you to get a spiciness that you’ll notice without overpowering the other flavors in this. The onions are so tender that you’ll barely notice them as you’re eating this ! This was a different (but tasty) take on pulled pork. This recipe came from Milk Street. We weren’t paid in any form to promote Milk Street. Take a baking sheet and line it with parchment paper, placing a rack inside afterwards. Pound each breast half into 1/4-inch-thick cutlets** using a meat mallet (we placed a piece of wax paper between the chicken and the mallet so the meat wouldn’t get stuck to the mallet). Pour the buttermilk and Tabasco sauce into a bowl, stirring to combine. Place the chicken in the buttermilk mixture, next placing the bowl in the fridge for 30 minutes. Take a shallow dish and mix the flour, cornstarch, salt, black pepper, and cayenne together in it. One at a time, take the chicken out of the buttermilk mixture, letting any excess buttermilk drip back into the bowl. Place the chicken in the flour mixture, making sure the chicken is fully coated. Shake off any excess before placing it on the rack. Once all the chicken is on the rack, let it stand for 10 minutes before dunking it back into the buttermilk, letting the excess drip off before coating it in the flour (shaking any excess off) and placing it back on the rack where it’ll sit for another 10 minutes. Take a 12-inch cast-iron skillet and pour the oil into it, setting the skillet over medium-high heat. Once the oil’s reached 350 degrees***, fry the chicken (we fried it one piece at a time) for 2-3 minutes per side or until it looks golden brown (we did 3 minutes per side). Place the fried chicken on a paper-towel-lined baking sheet (we used paper-towel lined plates). Place the chicken on the toasted rolls, topping it with the lettuce, pickles and remoulade. Combine all the ingredients in a medium-sized bowl. Cover, and let it sit in the refrigerator for at least a couple of hours to help all the flavors blend. *The fried chicken sandwich actually wanted a different recipe for rémoulade but we weren’t able to get all the ingredients for that recipe and we made this one instead. Thankfully this remoulade tastes really good with the chicken sandwich ! **We tried to get chicken breasts that weighed as close as possible to 8 oz. but they still weighed more than that. We hoped that simply the fact that they were still pounded out to 1/4-inch would mean that they’d be fully cooked. They were but we still checked to make sure they were fully cooked before letting them drain on the paper towels. ***The oil was too shallow for us to register the temperature so we just placed the chicken in the skillet once we heard a nice sizzle as the coating touched the oil. We don’t really get to eat out anymore so when we come across recipes that remind us of dishes that we’ve ordered in the past, we’re excited to make them ! When you try the chicken by itself, it has this really nice, crunchy coating but it does lose some of that crunch once the toppings are placed on it so just make sure you wait to put the toppings on until you know you’re actually going to start eating. The remoulade tasted so good with the chicken, the sauce almost had a bbq taste to it. The lettuce had a nice crunch to it, the pickles bring acidity but if you’re not a fan of pickles, this sandwich still tastes awesome without it ! Toasting the bun might seem unnecessary but it really helps support the weight of the chicken and keeps the bun from getting soggy. 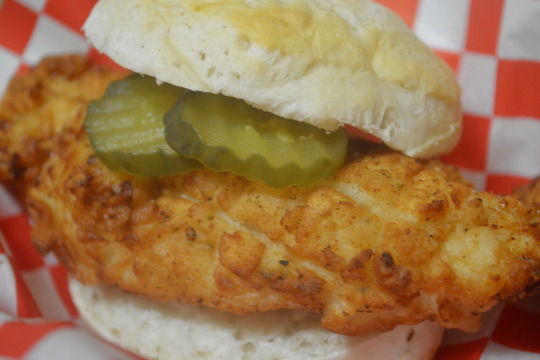 We’ll still keep trying other recipes for fried chicken sandwiches that we come across but we enjoyed this one enough that we’re definitely going to make it again in the future ! We got the fried chicken sandwich recipe from Cuisine At Home and the remoulade sauce from Simply Recipes. We weren’t paid in any form to promote Tabasco, White Mountain, Pepperidge Farm, Zatarain, Silver Spring, Cuisine At Home, or Simply Recipes. Take a resealable bag and add to it the chicken and pickle juice, sealing the bag afterwards. Place it in the fridge for 6 to 8 hours (I chose to flip the bag once in a while to ensure that all of the chicken had a chance to marinate in the pickle juice). Take a small Dutch oven out and pour the vegetable oil in until it fills up the Dutch oven halfway. Set the heat to medium until the oil reaches 350 degrees. In a shallow dish, mix together the flour, salt, pepper and onion powder until combined. Pour the buttermilk into a medium-sized bowl. Take the chicken out of the marinade, shaking off any excess pickle juice. Place the chicken tenders in the flour mixture to coat, shaking off any excess flour. Dip the coated chicken into the buttermilk, making sure it’s fully coated before returning it to the flour mixture where you gently press the flour onto the chicken so it’s entirely coated again with flour mixture. Place the coated chicken on a wire rack where any excess batter can drip off. Place a couple of chicken tenders into the 350 degree oil to fry for 8 minutes or until the chicken is fully cooked (reaches 165 degrees), turning the chicken occasionally during that time so that one side doesn’t get cooked more than the other. Once the chicken is cooked, place it on a paper towel-lined plate, sprinkling additional salt and pepper on afterwards if desired. Place the chicken on the bottom half of a biscuit, topping with pickle slices and honey mustard (if you want), placing the top half of the biscuit on afterwards. This turned out to be a delicious chicken sandwich ! Without any toppings, you can still taste the pickle juice from the chicken, it’s just more on the subtle side. 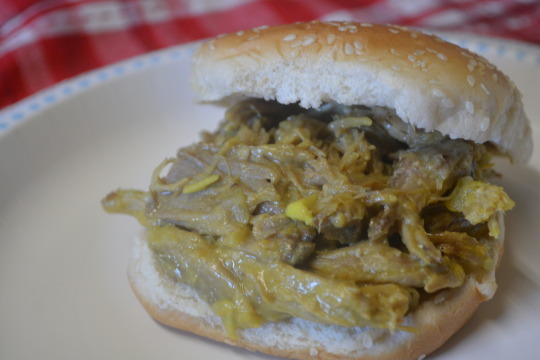 Adding the pickle slices on brings the flavor out much more and adds a crunch to the sandwich. If you don’t like eating pickle slices though, the honey mustard tastes really good paired with the chicken ! We got the chicken tender recipe from Taste of the South and the honey mustard recipe from Food Network. We weren’t paid in any form to promote Mt. Olive, Pillsbury, Taste of the South or Food Network. For the pulled pork: Preheat your oven to 300 degrees. Let the pork sit at room temp. for 30 minutes before seasoning it with the salt and pepper. Wrap the pork up tightly in aluminum foil and place it on a rimmed baking sheet that has a rack fitted on it (we lined the baking sheet with foil before placing the rack on). Stick the sheet in the oven and let the pork cook for 7 hours or until the pork reaches 200 degrees in the thickest part and can be easily pulled apart using a fork. For the mustard barbecue sauce: When there’s 20 minutes left on the cook time for the pork, take a saucepan out and add the butter to it, setting the heat to medium-low. Once the butter’s melted, toss in the onion and garlic, stirring frequently for 3 minutes. Stir in the remaining sauce ingredients and let the sauce simmer for 15 minutes. Once the pork’s cool enough for you to handle, remove the skin, bone and fat, throwing them away afterwards. Take the meat and shred it with a pair of forks. Place the pulled meat in a large mixing bowl, pouring the barbecue sauce over it afterwards, tossing to coat. Serve the pork on buns if you’re using them. *We didn’t like how little the salt and pepper seemed on the pork so we added more. We didn’t measure how much more we used though, so season to taste ! When we tried the sauce before pouring it over the pork, it had so much pucker power to it ! Something magical happened though after it was tossed with the pork, almost all the pucker power disappeared ! The sauce just took on a sweeter flavor to it, we couldn’t explain it. Can’t explain it, but we loved it ! We got this recipe from Family Circle. We weren’t paid in any form to promote French’s, Tabasco, or Family Circle. Start by making the rémoulade sauce: take a medium-sized mixing bowl out and add all the rémoulade ingredients to it, stirring to combine. Place in the fridge until ready to use. Take another medium-sized mixing bowl out and add to it the cabbages, sweet pepper slices, green onion, vinegar, honey and salt together, tossing to combine. Put a lid on the bowl and stick it in the fridge until you’re ready to assemble the po’ boys. Take a large mixing bowl out and stir the blackening seasoning, oil and lemon juice together in it. Add the shrimp into the bowl, tossing it around in the bowl to coat. Take a large nonstick skillet out (we used a large cast iron skillet) and get it preheated over high heat (we only went to medium-high heat). Once the skillet’s hot, add the shrimp in batches to cook for about 2 minutes per side or until the shrimp is pink and firm. Once all the shrimp’s cooked you can start assembling the po’ boys. Take the bottom half of the French bread and place the shrimp on it, followed by adding on the slaw and drizzling on the rémoulade sauce. Eat right away. All the components together make this a tasty sandwich ! For us, one serving was enough to keep us full for the rest of the night. Although this was delicious, it was a bit on the salty side but that might have been due simply to the brand we used for the blackening and creole seasoning. We got the po’ boy recipe from Louisiana Cookin magazine and the rémoulade recipe came from Paula Deen’s magazine. We weren’t paid in any form to promote Zatarain’s, Frank’s RedHot, Louisiana Cookin or Paula Deen’s magazine.